On July 9 a raccoon died in Toronto. By July 10 it was national and international news, which begs the question -- why? And more importantly, if you're in marketing: how? Although it's unlikely, for those that missed the story, a report of a dead raccoon was called into Toronto City Animal Services the morning of July 9th, and despite a timely initial response, the raccoon was not taken away for over 14 hours. In the ensuing hours a growing vigil spontaneously sprung up around the raccoon, as news of its untimely demise and neglect by city authorities went viral online and in the media. On July 9 a raccoon died in Toronto. By July 10 it was national and international news, which begs the question -- why? And more importantly, if you're in marketing: how? Although it's unlikely, for those that missed the story, a report of a dead raccoon was called into Toronto City Animal Services the morning of July 9th, and despite a timely initial response, the raccoon was not taken away for over 14 hours. In the ensuing hours a growing vigil spontaneously sprung up around the raccoon, as news of its untimely demise and neglect by city authorities went viral online and in the media. Why did this story go viral? 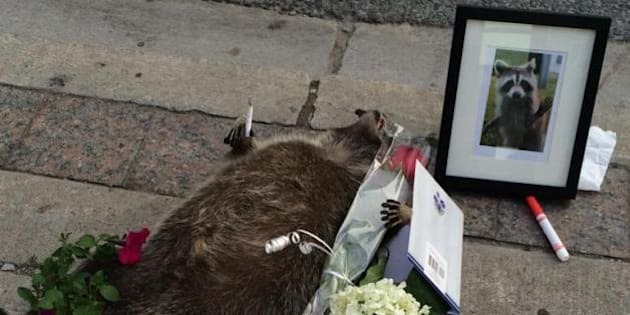 It was a toss up between poor taste and touching to see a dead raccoon up close with vigil items such as a framed photo, a rose and a condolence card later added. The key was visuals being added as the story unfolded, including a video of his final departure with a city worker. Everyone has a camera and video at their disposal these days on their mobile, so the fact that visuals told the story in a play-by-play fashion by random citizen reporters further added to the appeal. If there's one universal appeal, it's critique of those in authority, especially when they mess up, as became evident as the day unfolded and the raccoon remained unclaimed. Whenever the little guy can take revenge on the big guy, or someone with authority, the story will gain traction. In this case it was city workers. But it could just as easily be a business, an individual or an organization. Within a couple hours, as the story gained momentum, someone applied the hashtag #DeadRaccoonTO. From that point on everyone on Twitter who was talking about it used the tag, which made it easier to "channel" the content and see how interest was building. It also allowed others to immediately tune into the channel of conversation and understand the whole story from a multitude of reports and perspectives. There were a number of elements at play, but most prominent was "Statistical numbing" which helps explain why a single victim moves us more emotionally than many. It's why we care about one child in a war zone with a survival story more then reports of hundreds killed. Urban raccoons are something we normally care about as a perceived menace. But given a single one in distress, it took on an emotional angle. You could also argue that anthropomorphism was at play, where human characteristics are applied to things no human. The vigil that grew resembled a roadside human death, complete with a framed photo of a raccoon, a rose, a condolence card and a candle. Key to a story going viral online is the impact of key influencers. In this case several users with large numbers of online followers took to the story. Prominent was Toronto City Councillor Norm Kelly. Both online and traditional print and broadcast media monitor online for stories to cover. Twitter is heavily used by reporters to find breaking news. Because they are in the business of gaining readers, listeners, viewers or followers, they need to know when something is "hot." Twitter is their tool to find stories and detect if they are growing. Online feeds traditional media, and traditional media such as print and TV or radio broadcast, in turn feeds online again. It becomes a vicious circle of momentum building. That cycle largely explains why the morning of July 10 local and national news sources where talking about the raccoon, and why you likely saw it on some social media platform within the day. You might wonder where the humour is in a dead raccoon, but they found it. It was suggested online by someone on Twitter, that in solidarity for the lost raccoon and his forging urban counterparts, those citizens of Toronto leave their garbage can lids open for one night. Someone also posted on Twitter an image of Stephen Harper in parliament, with head bowed, obviously out of context, suggesting that the government of Canada was going to hold a national day or mourning. Starved of Rob Ford antics, the citizens of Toronto obviously needed new fodder. Enter the raccoon. The reality is that in the face of other important hard news such as ISIS terror or the plight of Greece in the EU, bizarre news sells. Call it human nature to want to hear about weird stuff. Perhaps its escapism from reality, but media knows that odd things make great headlines, and great headlines gain a following. Tagging a celebrity is usually good for gaining traction, since their followers, usually in the hundreds of thousands, will chime in. In this case, someone tagged a Drake photo, suggesting he was concerned for the raccoon. Momentum continued to build. It's human nature to love a story. This one unfolded throughout the day. It had classic story composition: A villain, a hero, a tragedy or challenge, a climax and resolution. Along the way various characters added themselves to flush out the rich details. It was a story told live and developing, but the plot was built out by contributions of all who added online details to help tell it and spread the word. Never under estimate the power of storytelling for universal appeal, especially if you allow others to participate in how it unfolds. Who would have thought a little raccoon that died could gain so much attention. The story certainly is an insightful example of how things go viral.